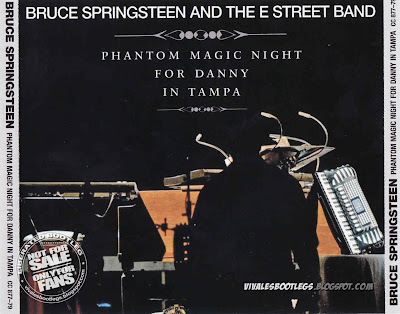 Recorded Live at St. Pete Times Forum, Tampa, FL, USA - April 22, 2008. Excellent Audience Recording :: Silver CDs :: Lossless FLAC. Files: 36. :: Size: 1.28 GB (flac). 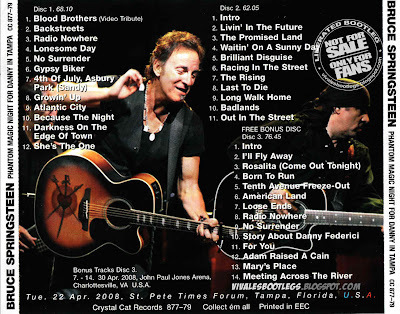 Personnel: Bruce Springsteen - guitars, harmonica, lead vocal :: Steve Van Zandt - guitars, mandolin, backing vocal :: Patti Scialfa - guitars, backing vocal :: Nils Lofgren - guitars, backing vocal :: Gary Tallent - bass :: Max Weinberg - drums :: Roy Bittan - keyboards, accordian, backing vocal :: Charlie Giordano - keyboards, accordian :: Clarence Clemons - saxophones, percussion, backing vocal :: Soozie Tyrell - violin, guitar, backing vocal. Notes: Phantom Magic Night For Danny In Tampa (CC 877-879) is a three disc set featuring the long April 22nd, 2008 show at the St. Pete Times Forum in Tampa, Florida. 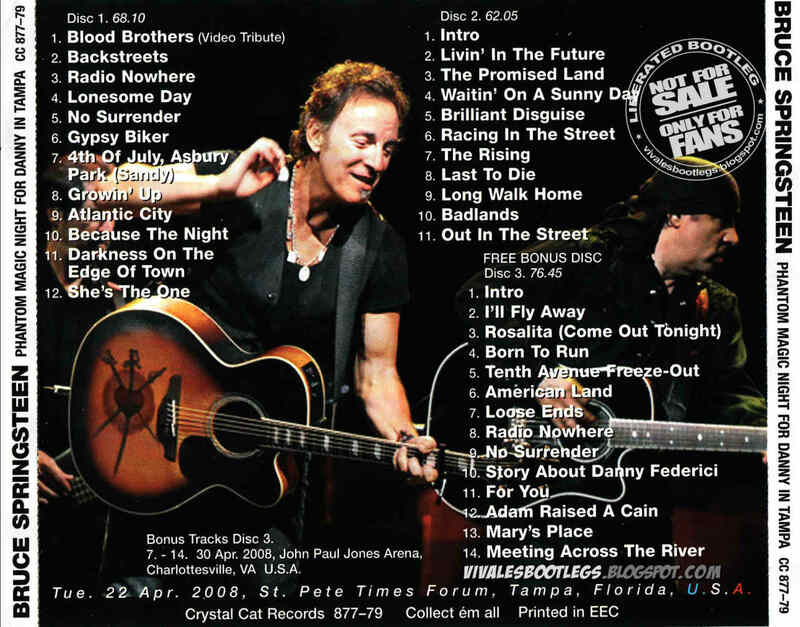 The third “bonus disc” has seven bonus tracks the John Paul Jones Arena in Charlottesville, Virgina on April 30th. Show postponed due to the death of organ player Dan Federici. A montage of archive footage of Federici was played prior to the band appearing on stage to the song Blood Brothers, whilst his Acordian and Organ was placed at the centre of the stage with the spotlight shining on it. This mark of respect continued throughout the remainder of US leg of the tour. They then went into a very emotional rendition of Backstreets. Dan's trademark song, 4th July, Asbury Park (Sandy) was played with Roy Bittan on the accordian. Further emotional tributes were shown by playing Growin' Up and I'll Fly Away. Thanks for this awesome show. A great tribute to Danny.